This durable leak-proof hydration bladder includes an additional insulating sleeve that is ideal for extreme environments. It can also be used as an effective pouch to strap your bladder to the outside of your pack, on your boat, or anywhere there are straps. The Crystal Creek Hydration Bladder is great for hiking, biking, trail running, hunting, and more. The large capacity helps you to stay hydrated on your longer treks, and the positive flow valve gives you hands free rehydrating. Wherever you need access to your water source you’re covered. The large lid allows easy access for cleaning and filling and the dishwasher safe material makes it even easier to care for. Clear construction ensures you can see how clean your bladder is. The bonus insulated sleeve provides an extra layer of protection for your bladder, and is the answer for adventures in extreme environments–cool water quenches your thirst in hot weather and won’t freeze up on you in cold weather. And no need to worry about that awful plastic taste with this FDA approved and BPA free bladder made from food grade materials. The extra reinforced seams and 3L (100 oz) size means your water supply lasts long. Your product life is extended, too. Crystal Creek offers a 100% money back guarantee if, for any reason, you are unsatisfied with your purchase. Ever since a very long hike through the desert of Utah, I’ve been looking for a larger hydration bladder than the 2 liter I normally carry. On that day I solved my water requirements by carrying two 2 liter bladders in my pack, a bit of overkill. The solution, obviously, would be a 3 liter size. As serendipity will have it, just about the time I began looking, along comes startup company Crystal Creek. In addition to its 3 liter size, the insulated hose and insulating jacket were immediately appealing to me. So I took the plunge and purchased one. With a money back guarantee there was nothing to lose, and plenty to gain. When the bladder arrived, many of the other features also raised my eyebrows and put a smile on my face. Dave Stewart, the founder of Crystal Creek, really put a lot of thought into this product. 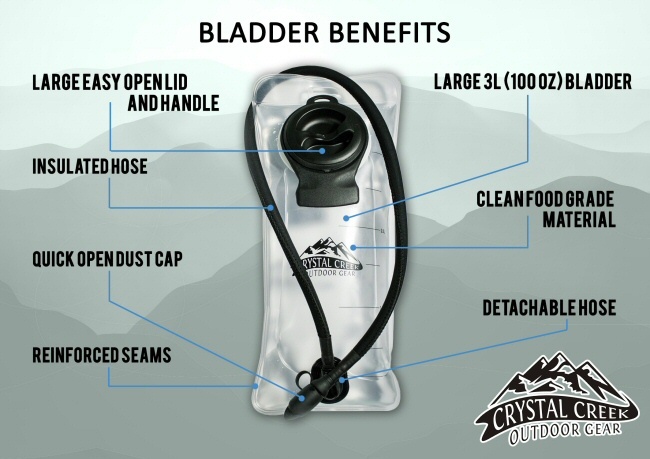 He obviously knows hiking and hikers because of the little touches that make the Crystal Creek Hydration Bladder easy to prepare and use, even clean. When did you ever find a hydration bladder that was dishwasher safe? This is the answer to perhaps the biggest drawback of past bladder technology. Cleaning has always been a pain. Whether you use vinegar or baking soda or mouthwash, it was never easy. Now it is. Just prop the mouth open and lay it in the dishwasher. What could be more simple than that. The detachable hose also makes this uncomplicated. If desired, you can still obviously clean with a brush, but the clear material makes the inside easy to see so you can assure it is clean. The lid is nice and big, so filling is a snap. And the lid is simple to close with screw threads. No need to worry about alignment and hokey arrows like the trend in some other bladder products. I do have one little complaint about filling, though. When loading it all the way to the 3 liter line, it is a bit difficult to close the lid. Sticking to about 2¾ liters is fine. Other bladder products use a bite valve and locking switch to turn on and off water flow. The Crystal Creek Hydration Bladder has changed that some. The positive flow mouthpiece is a different concept. Instead of biting and sucking, just grab the mouthpiece with your teeth and pull. It took me a little getting used to, but within a half hour of beginning my first hike I was an old pro with this technique. Also, instead of a locking mechanism to obstruct water flow when not in use, the Crystal Creek deploys a dust cap. Keeps trail grit away from your mouthpiece, and a 2nd level of leak prevention. The bite connector pops off easily so the system can be filled with purified water via a Sawyer filter or other compatible system. A HUGE improvement is taste. Yes, taste. Every other hydration bladder I have ever used tasted like rubber, or plastic… at least for the first few months or so. The Crystal Creek tastes like water. Yay! I could not detect any taste from the bladder material itself. That alone might be a reason to consider the Crystal Creek for your next bladder purchase. The 3L size isn’t unweildy. It’s a little bit taller than a 2L bladder, but most of the difference is in the width. Since fit within a pack almost always depends on a bladder’s length, the additional width does not add a burden. The 3L bladder fit in my 30L day pack just fine. 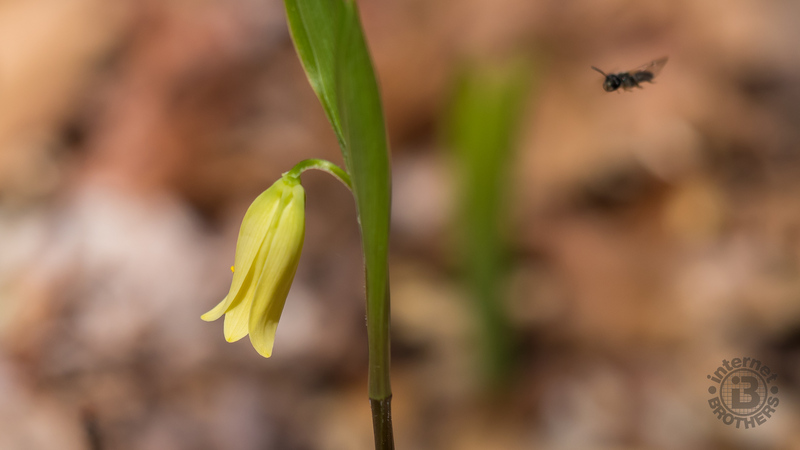 If you aren’t worried about your water supply, you can enjoy tiny sights like these. I haven’t even talked about the insulated hose and insulating jacket yet. Whether keeping your water cooler in summer, or protecting it from freezing in winter, these features are another nice touch of the Crystal Creek Hydration Bladder. Put ice cubes in the bladder if you like and they will avoid melting longer. Has your water turned to slush on one of those below freezing winter mornings? In my experience, it tends to happen quickest right at the mouthpiece. The insulation on the hose and the jacket around the bladder will assist with freeze prevention. Trying to nurse sore muscles after a long day? This bladder can even be used as a hot water bottle. The 5oz insulating sleeve is easily removable, like a jacket, so use it or don’t, depending on weather conditions. With the insulating sleeve on, a canvas hook and straps enable you to connect the system to the outside of your pack, another astute touch if internal space is limited. Like I said, Dave, the owner of Crystal Creek and developer of this bladder, really thought the design through. The Crystal Creek Hydration Bladder is tough and durable. Built to last, the seams at the edges are double reinforced. Dave has demonstrated how he filled it completely full, then stood on it. The seams held. The lid held. The hose connector held. Chances are it will hold in your pack as well. The warranty includes a no leak guarantee. The Crystal Creek Hydration Bladder and Insulating Sleeve has a suggested retail price of US$49.99 and can be purchased from Amazon. Prior to now there have really only been one or two names in hiking hydration bladders. Well, it’s time to add Crystal Creek to the list. I have a new favorite hydration bladder. In my opinion Crystal Creek is the current best product on the market. Just to show you how Crystal Creek stands with their product, after approximately 14 months of use, I developed a slow water leak at the connector of the bite valve with the bladder hose. Crystal Creek sent me a replacement hose right away, no charge, no questions asked. Great customer service.